A staple part of any digital campaign should involve a competitive research exercise. This is particularly relevant when looking at link building and content strategy. There are tons of tools out there that can be used to spy on your competitors’ links, their content and also their social presence. This information is incredibly valuable and can be used for both some quick wins and as part of your long term strategy. When it comes to competitive research, the phrase “no need to reinvent the wheel” really rings true. I mean, if your competitors have done something that works, why wouldn’t you at least consider replicating their success? I carry out competitive link research on a monthly or weekly basis for all of my clients and personal websites. The insight that can be gained from looking through the link profiles of your competitors is definitely worth the time spent. This has to be my all-time favourite SEO tool. During Moz’s transition from the SEOmoz brand, the tool was unavailable (to my frustration), but I’m happy to say that it’s back up and running. The competitive link finder allows you to plug in up to four of your competitors to cross reference the links that they have pointing at their domains to find commonalities. These commonalities represent links that could potentially be gained by your own website as well. This has helped me to identify some real link building gems over the past couple of years and I really can’t stress enough how time effective this tool is. Tip: When plugging in competitors into the tool, don’t just use obvious ones. Try to plug in competitors based around specific search terms that you’re trying to rank for. This can often result in you finding link opportunities from keyword-relevant sources. Alongside the competitive link finder tool, I also use a combination of Majestic SEO and the SEO Tools plugin for Excel. Using these two tools I’m able to find any new links to my competitors that have recently been indexed. If you haven’t used the SEO Tools plugin before then you can view my full tutorial here. Once you click Insert, you get a nice big list of the latest links that your competitors have gained, along with the anchor text used and which page has been linked to. It’s also useful to know if the link is a dofollow or nofollow link. Twitter holds a wealth of information about your competitors, and more importantly, who are the major influencers/evangelists of your competitors’ content. 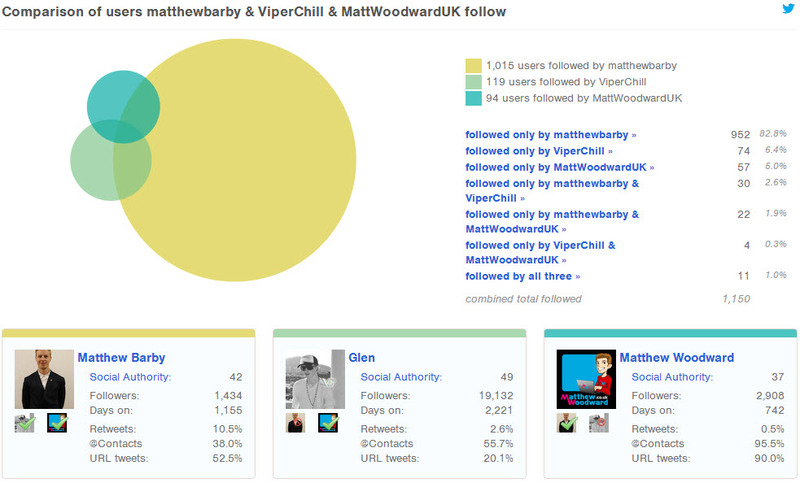 This is where I utilise another Moz-owned tool, Followerwonk. For me, the best feature of Followerwonk is the ability to carry out analysis on the followers of multiple accounts to find trends/commonalities. This is under the Compare Users tab. Using this feature, I often plug in three of my competitors’ Twitter accounts and have a look at any common followers that they have – if these users are interested in a few of my competitors, it’s likely that they’ll have some kind of interest in me. Use BuzzSumo to search for content that has been shared heavily within Twitter that is similar to my content (for example, articles that focus around blog monetization). Use Topsy.com to analyse a few of the most popular URLs that are related to my content. From this analysis, I will export the influential Twitter users that have tweeted the content. Plug in some of these users into Followerwonk and find commonalities in who they follow. Target these common followers to gain exposure to my content as they can reach a large amount of my targets. A single tweet from these accounts will expose my content to a whole host of interested and relevant people. One thing that often gets mentioned is tracking any mentions of your brand online so that you can follow up on getting a link or engaging in conversation. The only issue here is that a lot of smaller businesses don’t actually get mentioned a whole lot. This is where you can listen in on your competitors to find opportunities for yourself. Each of these tools have different advantages to the other. Mention.net is a really great tool for tracking a number of different competitors and it will give you email alerts and weekly summaries of mentions. This is particularly good for identifying any links/mentions that your competitors have gained as a result of timely content – this intelligence can then be used to replicate their success. The next tool, BuzzBundle is a lot better for real-time analysis and more in-depth listening through social media and communities. Matthew Woodward did an awesome review/tutorial of the tool that’s worth checking out. In a nutshell, BuzzBundle allows you to track mentions across forums, blogs, social media and Yahoo! Answers. You can then plug in your social media/forum accounts to engage on the posts in real-time. This is perfect for spotting quick opportunities or content gaps. Alongside this, you can easily get an understanding of what your competitors are doing within social media. Finally, I use Fresh Web Explorer. I’m not an enormous fan of this tool, but since I have a Moz subscription I feel compelled to take advantage of it. Fresh Web Explorer allows you to track mentions of specific keywords over time. This could relate to specific mentions of content, authors, competitors, influencers, etc. The results vary depending on what you’re searching for, but if you have a Moz account already, give it a try. Note: Richard Baxter wrote a short overview on another listening tool called, Talkwalker. I haven't used the tool yet, but from looking at what Richard has said it looks like it's a pretty cool tool - may be worth checking it out. Another really underrated, but incredibly useful piece of analysis is into the content that your competitors are producing. Having a good understanding of what has worked for similar and competing websites can be a valuable insight that can be fed into your own campaign. I often scout out which content has performed well on competing blogs so that I can analyse things like, the optimal article length, the types of content that have been shared widely, the best performing format of content (i.e. is it video, imagery, slide decks, etc.?) and who is actually linking to the content. If you’ve read any more of my articles then you’ll know that I LOVE these two tools (FYI, I have no affiliation with them whatsoever). They both do a great job at scouring through domains to find popular content (i.e. content that has been shared heavily on social media. Social Crawlytics is a free tool (and an awesome on at that), that allows you to gather analysis around a domain to find popular content. It gives a breakdown of the top authors on the site (great for analysing multi-author blogs), shares itemised by each social network, the top content formats and it also gives historical sharing data so that you can see how the content has been shared over time. Pretty handy if you’re developing a content strategy that you want to be as effective as possible, right? Using BuzzSumo, you can do a similar thing but gain some extra knowledge about who is actually sharing the content as well. All you need to do is plug in one of your competitors domains into the Top Content search bar. BuzzSumo will then pull off a list of the top performing content within that specific website. But, that’s not all it can do. Next to each of the URLs, you can click the View Sharers button to find out exactly who has been sharing the content on Twitter. Now, this data alone is pretty damn valuable – you could use this list of users to inform them of similar content that you’ve created to encourage more shares to your site. As well as this, you can take a quick look at other URLs that these individuals have tweeted. You can then start using the process that I outlined in my article that focused around profiling your outreach targets. You don’t need to reinvent the wheel every time you attempt to create new content. Having an understanding of what works within your industry will help you be more targeted and effective with your own campaign (duh!). Hijack your competitors success to bring in results yourself. Just watched it Mr G – good vid – you full on with wistia? I’m thinking of bailing on vimeo. one of the most interesting post of recent times. Awesome! All I want to have was on 1 tool. Great! Hey Mathew, I’ve not been on here for a while… I started to miss you a bit, well mostly missing your content lol… but another great post.